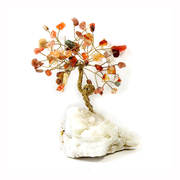 Beautiful genuine 3" Mixed gemstone tree set on an Quartz base. Our crystal gem trees, also known as ‘feng shui’ trees, are original and inspiring ornaments that your can really bring to life in your home. The crystals are mounted on flexible metal branches and rooted in a solid piece of quartz,it’s wonderfully soothing and relaxing; like having your own crystal bonsai tree that never needs watering! Your gem tree will come carefully wrapped, just open and arrange the leaves to create this lovely semi-precious Gemstone Tree.